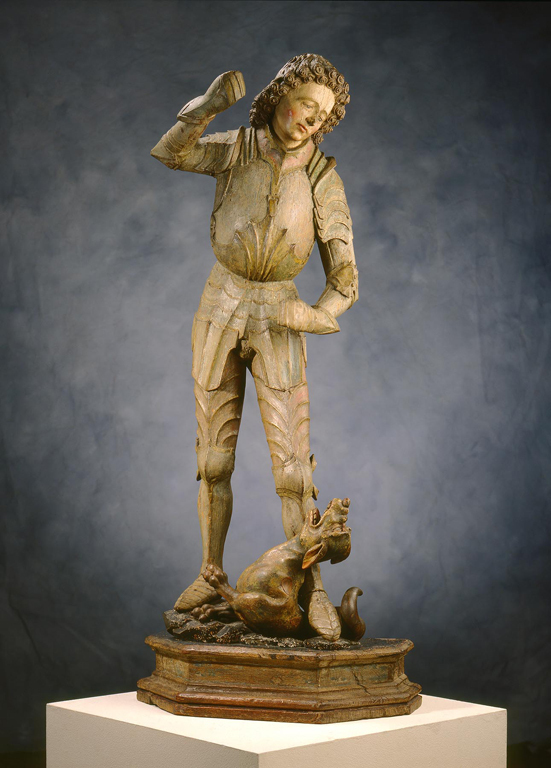 This animated sculpture of St. George was once part of a retable, or carved wooden altarpiece, in a church. St. George was a popular subject for patrons and artists alike during the Renaissance because he symbolized the triumph of good over evil. Missing here is his lance, which would have pierced the writhing body of the dragon beneath his feet. This sculpture, and the altarpiece in which it was originally installed, would have been polychrome, or painted with several bright colors, traces of which are still visible. The intact ensemble would have been a vivid and dramatic backdrop for church ceremony. Old Masters, New Beginnings. The Milwaukee Journal Sentinel, July 23, 2000, p. 10E, color illus., NewsBank America’s Newspapers, http://infoweb.newsbank.com (accessed August 24, 2017). Winters, Laurie et al., A Renaissance Treasury: The Flagg Collection of European Decorative Arts and Sculpture. New York, New York: Hudson Hills Press, 1999, p. 136, cat. 66, color illus. p. 137. Gómez-Moreno, Carmen. Medieval Art from Private Collections. New York: The Metropolitan Museum of Art, The Cloisters, 1968, no. 54. Atkinson, Tracy. Wisconsin Collects, Milwaukee, Wisconsin: Arrow Press, 1964, p. 13, cat. 105. Wisconsin Collects, Milwaukee Art Center, September 24, 1964–October 25, 1964.